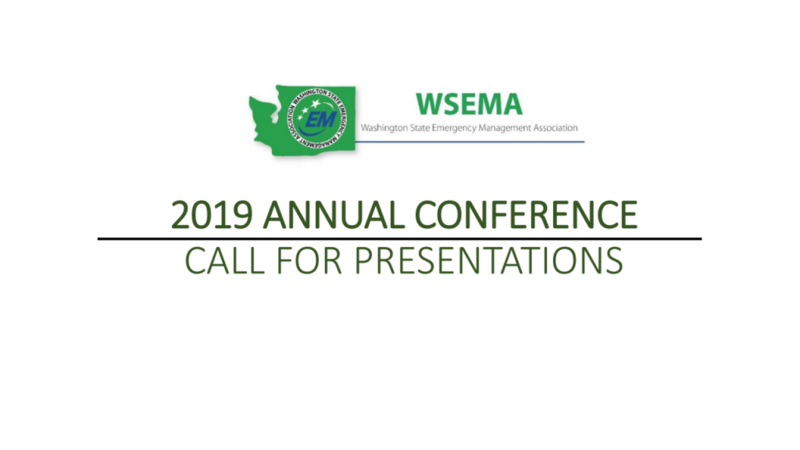 The Washington State Emergency Management Association (WSEMA) is seeking presenters for our 2019 conference to submit ideas for innovative and engaging conference sessions. CONFERENCE THEME: The theme of this year’s conference is ‘A State of Opportunity: Emergency Management Leading the Way in Washington State.’ The focus of this year’s conference will be on recognizing the pivotal role that emergency management plays in advancing readiness and resilience across the whole community. DEADLINE: The Call for Presentations for the 2019 WSEMA Annual Conference will be open until April 19, 2019. Presentations will be selected by the Conference Committee and Executive Board in May. SESSION TYPES: WSEMA is seeking a variety of presentation types to build an interesting and diverse agenda. Presentation proposals may include engaging keynote proposals, lecture-based presentations, activity-based workshops, case studies, or panel discussions. Partners may also submit 10-15-minute ‘SnapShot’ presentations to provide quick insights on innovative and emerging topics in emergency management or offer to develop a poster that can be highlighted during breaks. Please indicate the type of presentation you propose in your submittal.